Since the beginning, the .BIBLE top-level domain (TLD) has had a most valuable partnership with YouVersion, the maker of the Bible App. Together we celebrate this most popular Bible app recent achievement of reaching over 300 million installs worldwide! For the history buffs, here's some background for context. Our partnership began before the launch of the .BIBLE TLD as YouVersion and its owner/operator Life.Church joined up as a charter .BIBLE Advisory Council member and gave an endorsement that was instrumental to the successful launch of the .BIBLE TLD in March 2016. Free.Bible was one of the first .BIBLE domain names launched. Free.Bible is the fastest and easiest way to share the Bible app for any device. A new beta project of our partnership is underway to provide the fastest-loading web pages for the Bible. First starting with the book of Psalms, YouVersion has launched over 2,000 AMP pages at Psalm.Bible with every chapter and verse of the Psalms. 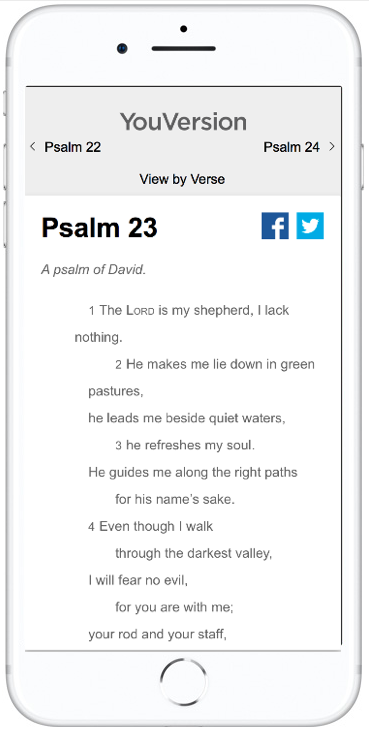 With web addresses beginning with Psalm.Bible, every verse in the Psalms are optimized for search engines and designed to load as fast as possible using Accelerated Mobile Pages (AMP) specifications. AMP pages provide a great user experience across many platforms and help ensure all people experience the life-changing message of the Bible. YouVersion plans to complete this project in 2018, starting with the top trafficked books and going down the list. The YouVersion team has already integrated these new .BIBLE domain names when people share a Bible verse in the Android version of the Bible app. Stay tuned here for further developments. [update March 2018] Every book of the Bible and every Bible verse can be viewed the fastest at these .BIBLE web pages, both the Old Testament and the New Testament. On any web browser's address bar, enter a Bible book name with .BIBLE on the end, and hit Enter. Voila!